A network of popular Facebook pages that have built large audiences catering to Australians agitated over hot button issues such as Islam, refugees and political correctness is under the control of trolls and scammers from the Balkans who profit from the outrage they stir up. An ABC News investigation has identified at least four popular pages with shared characteristics that are managed by administrators based in Kosovo and the neighbouring countries of Albania and the Republic of Northern Macedonia. The location information only recently became discoverable when Facebook flicked the switch to bring Australia into line with new advertising transparency measures that have been in place in the United States since mid-2018. All four pages host a mixture of patriotic and agitational memes and a potpourri of news reports sourced from a single website that specialises in repackaging content stolen from mainstream and independent news organisations, including several from Australia. The xenophobic content focuses on topics such as refugees, immigration, Muslims and Islam and free speech. The pages also take pot shots at politicians from Labor, the Greens and some moderate Liberals. The Facebook pages have a combined fanbase of 130,000-plus, which has been built up over several years. 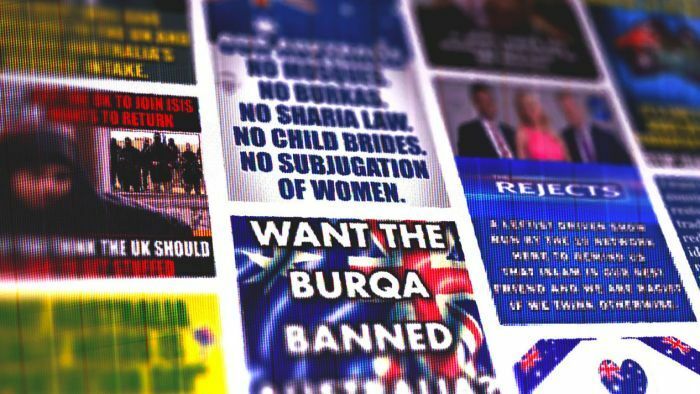 The oldest and most popular page, “Australians against Sharia”, has been publishing since June 2013. Despite the niche focus of these pages, some of the posts have been shared over 20,000 times, indicating the promoted causes have resonated strongly among discontented Australians. For popular Facebook pages like these, the potential reach would be at least 10 times more than the fanbase, said Joe Youngblood, a digital marketing consultant based in Dallas, Texas. The three other pages are called “Aussie infidels”, “Stop the Mosque in Melbourne” and “Stop all Mosque in Narre Warren” (sic). Narre Warren is a suburb on the south-east outskirts of Melbourne. A Facebook page is a public profile for use by organisations, businesses, causes and celebrities. Popularity is measured by a “fan” count, the number of people who “like” a page. The “Australians against Sharia” page, which has over 67,000 fans, has also reposted memes attacking Labor Party identities including Bill Shorten, Penny Wong and Julia Gillard, the Greens’ Sarah Hanson-Young and the Liberal Party’s Julie Bishop. Maverick Queensland conservative senator Fraser Anning is the only politician who receives consistent support from the page. There is no suggestion the senator is in any way connected with the page or its administrators. The Facebook pages are the spokes of the network, and at the hub lies a news website that lives at the HealthyNewsFree.tech web address. It also brands itself as “Worldwide”, “Worldwide Press” and “Healthy Lifestyle”. The website’s ownership details have been concealed from public view. But the fact that the website’s stories are the only ones ever promoted by the Facebook pages suggests there is an intimate relationship between the two entities. Also, some of the articles on the website are written in Albanian and relate to events in Kosovo, where 90 per cent of the population is ethnic Albanian. If you are using the Facebook app on your phone — as most users would do these days — and you click on a post from one of these pages, it opens the story in a proprietary Facebook format known as Instant Articles, or IA. The IA version of the story is hosted on Facebook’s servers instead of on the publisher’s website, theoretically allowing the story to be loaded faster. But it also allows Facebook to replace any ads that appear on the website version of the story and insert its own ads via Facebook’s Audience Network service. For this, the publisher receives a cut of the takings. Moreover, all those English language articles have been stolen from other websites including the ABC, The Sydney Morning Herald, Mail Online, The West Australian, Reader’s Digest and The Daily Express. Publishers like the people behind HealthyNewsFree must apply to use the IA format and to join the Audience Network service. The publisher and its content are supposed to be vetted by Facebook. Ads and sponsored content from organisations such as Krispy Kreme Australia, TAFE NSW, the Australian Reptile Park, Inglis, Foxtel, James Cook University, the Australian Financial Review and the Japan National Tourism Organisation are appearing on IA versions of HealthyNewsFree articles. “Advertisers are being duped into paying for ads for which they have little control over where they are shown,” said David Glance, a senior research fellow at the University of Western Australia’s school of physics, mathematics and computing. The Australian Reptile Park removed the ad from distribution on Instant Articles after being approached by ABC News. “Please understand the Australian Reptile Park does not control the placement of our ads within Instant Articles on the Facebook platform and their appearance does not in any way endorse any online article,” a spokesperson said. A spokesperson for TAFE NSW said it enjoyed a “strong working relationship with Facebook” and met regularly to “optimise marketing outcomes” and “manage any potential technical issues that may arise”. Kirspy Kreme said it would “work with our Facebook representatives to determine our best path forward”. Facebook has been approached for comment. However, at the time of publication, the company would only say it was investigating the issue. Mr Youngblood has had firsthand experience with scammers from Kosovo who are running these types of Facebook rorts. In 2017, he attempted to buy the brand name “Texas Life”, which was being used by a Facebook page operated by two men from Pristina, the capital of Kosovo. Like the Australian examples, the Texas-themed Facebook page included stolen memes and articles curated to amplify hate and foment social division. He was swindled out of $US550 ($778), but not before the men he was dealing with showed him how their operation worked and how they profited handsomely from their venture. And he was outraged that Facebook had not clamped down on this type of activity. The Kosovo pages use a business model like the one revealed in 2016 when the town of Veles in Macedonia, formerly part of Yugoslavia, was identified as the epicentre of a “fake news factory” catering to Americans radicalised during Donald Trump’s political ascendency. Veles was home to a cottage industry of publishers, many of them teenagers, who manufactured pro-Trump news during the US presidential campaign and used clickbait Facebook posts to drive readers to their advertising-supported websites. Many practitioners claim to have made thousands of dollars a month making fake news, an exercise that some pundits say helped carry Mr Trump all the way to the White House. The network uncovered by ABC News is of a smaller scale than was the case in 2016, and instead of creating fake news, the Facebook pages in question are merely churning stolen content. However, it does show that despite attempts by Facebook to shut down what it euphemistically calls “inauthentic behaviour”, there are still those who find ways to profit from manipulating public sentiment. Sarah Thompson is an artist and horsewoman from rural Indiana who stumbled across another Macedonian Facebook scam in 2016 and has been burrowing down that rabbit hole ever since. She sees more and more activity coming out of the Balkans and places like India and Pakistan. And so long as Facebook has a conflict of interest over its commercial interests, she cannot see how the company can also play an effective role as the regulator. “I don’t hold out much hope to fight the bad guys,” she said. Ms Thompson now runs a website and Facebook page called Exploiting the Niche, which is dedicated to exposing scams, calling out fakes and educating people about how the system is gamed. Last year the ABC discovered another scam involving Facebook and Instant Articles and the use of inflammatory content. Ads from companies such as BMW, Woolworths, STA Travel and Visit Victoria were appearing in articles, some featuring overtly extremist themes. Facebook, which over recent years has been on the receiving end of multiple complaints about privacy, shoddy supervision and bad faith, subsequently kicked the publishers off Instant Articles. A year ago, Media Matters for America, a US-based non-profit group that monitors conservative misinformation, uncovered a similar network operating out of Kosovo that was posting fake news to a largely American audience. The people behind this network were traced to the town of Podujevo in northern Kosovo, two and a half hours’ drive from Veles. And last week Facebook announced it had shut down 168 Facebook and Instagram accounts and profiles linked to two separate networks managed by people from Britain, Pakistan and Romania. The networks, which employed some of the same techniques that are being used by the Australian pages, were accused of inciting hate and political division in Britain and Romania. But busts like this are rare. Critics like the University of Western Australia’s Dr Glance argue that Facebook is only going through the motions. “Most of what Facebook is doing in the area of cleaning up the platform is really superficial and aimed at doing as little as they can to keep the regulators from taking the next step in clipping their wings,” he said.